If you use a tweezer regularly you will understand the need to find the perfect one that grips well and just works – full stop. Also, how often are you scrambling to find the perfect amount of light so you can see what you are trying to do? With me, it’s often. Then I got introduced to La-tweez which is the cutest, most convenient and innovative beauty product I have come across in a long time. For me it ticks all the boxes. They grip really well, and remove the hair straight away. I love the light element as it is perfect to use for on-the-go purposes. It fits perfectly into my make-up bag and the mirror inside the carrying case is great to use for emergency touch-ups when I am out. I think every girl needs one of these and the crystal element makes it even more girlie and appealing to me. Overall 10/10 for this product. I’ve gone through a lot of tweezers in my lifetime and up until now I have never found one that ticks all the boxes. That was until I tried this little miracle from La-tweeze. The first thing that caught my attention was the lovely packaging – I chose the pink tweezer (they’re available in either pink or black) and both the box the product comes in and the actual product itself is beautiful. The little Swarovski crystal on the tweezer is a light switch (so not juts a pretty decoration) and the casing that houses the product has a mirror in it, so you can use it anywhere you are. But most importantly, the functionality of the product is excellent. The tweezer grips the hair firmly, without breaking it (my pet peeve) and the two tips come together perfectly without any gaps. The little light makes a major difference – it lights up the area so brightly that you can see even the lightest of hairs. I love the way it all fits in a tiny carry case – now I have my tweezer, my light source and my mirror all together! It’s the perfect handbag product, but because of the quality of the product, it’s great to keep an extra one at home too! Definitely one of the best tweezers I have ever used! The La-tweez Pro Illuminating Tweezer is quite possibly one of the most revolutionary products I’ve seen in a while. One actually wonders why something like this wasn’t invented sooner. The perfectly aligned stainless steel tips and really bright LED light are a winning combination for the perfect tweeze. No more having to find the perfect light source for brow-shaping! It also comes with a handy little carrier case with a built-in magnifying mirror. For an extra bit of bling, the on/off button is a Swarovski crystal. La-tweez sets the bar pretty high with this product and I doubt you’ll ever both about buying another set of tweezers again. This is a genius product! That’s the crux of this review. It’s a tweezer with a twist! The packaging is gorgeous, from the little La Tweez shopping bag right down to the useful lipstick-sized container that ensures you can take it anywhere, it would even fit into the tiniest clutch bag. The packaging has an air of quality, which corresponds with the tweezer itself. The size of the product is more compact than most standard alternatives. The illuminating LED light not only makes the strays easier to tweeze, but also shows other fine hairs that you may otherwise have missed, no matter how dark the surroundings. And it’s not just the light that makes this product great. 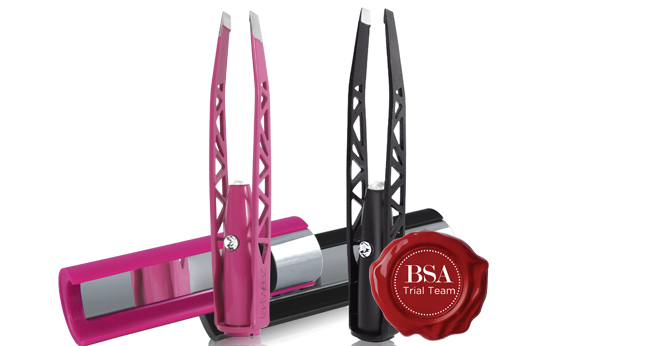 The slanted blades are excellent quality and provide a slip-free grip for accurate professional work. The grip is also great and is yet another way to ensure accurate grooming. I would definitely recommend this product. It makes for a great gift or stocking filler! I’m a guy and if there’s one thing that I cannot stand, it must be eyebrows that are growing into all directions! Thanks to La-Tweez,I can now get rid of any unwanted hair anytime, anywhere thanks to the built-in LED light. The La-Tweez is made out of premium materials so you don’t have to worry about it breaking when you need it most and it also comes in a chic packagaing which can be carried with you wherever you go. I love it! 5 out of 5! The La-tweez Pro Illuminating Tweezers arrived in a very cute black gift bag, which contained the purse like box housing the tweezers. It is all super girly which is exactly what this product oozes. The tweezers themselves are very geometric in appearances with the arms being a fun pattern of triangular shapes ending in stainless steel tips that offer great grip of the hair. The LED light is activated by a Swarovski crystal, which adds that extra bit of class and ‘girlyness’ to these already fantastic tweezers. They also come with a very nifty, lipstick size carry case with a built in magnifying mirror, perfect for your handbag! Getting back to the practicality of the tweezers, they grip the hair well with no slipping which results in precision tweezing of those unwanted hairs. The light is a great extra as it allows you to see hairs that you didn’t even notice before, adding to the precision that the La-tweez Tweezers offer. This is definitely a product that I would recommend, a winner in my books for sure!